Also available for download: Microsoft Word format (click here - 463 Kb) or Acrobat pdf file (click here 393 Kb). 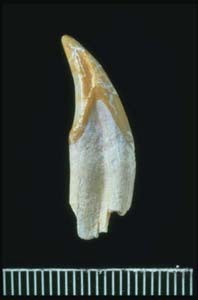 Ape canine from Site JD3, Jebel Dhanna (Scale in mm). 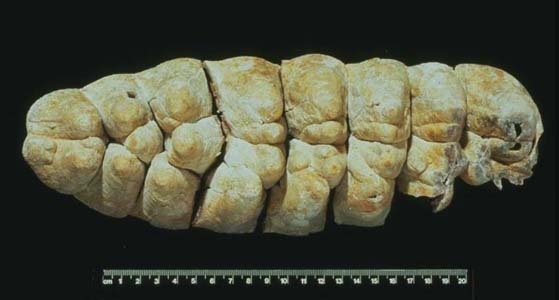 Tooth (lower 3rd molar) from the four-tusked elephant, Stegotetrabelodon syrticus, found at Site R2, Ras Dubayah. 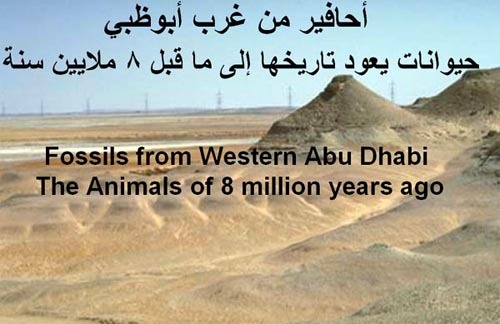 The exhibition "Abu Dhabi 8 million years ago - Fossils from the Western Region" is due to open shortly in the foyer of the headquarters building of the Environmental Research and Wildlife Development Agency (ERWDA) in Abu Dhabi, where ADIAS has its offices. The exhibition is sponsored by ADCO, Takreer and BP, with support from ERWDA and the Private Department of HH the President. The exhibit will display for the first time in Abu Dhabi the important Late Miocene fossils discovered in the Western Region. Fossils of the primitive elephant species, Stegotetrabelodon syrticus, on display include the skull, jaws and femur discovered at Shuweihat, as well as the 2.54 metre long tusk discovered by ADIAS at Ruwais in November 2002. Please note that copies of a DVD which includes all three above films can be purchased directly from the ADIAS office in Abu Dhabi for 80 Dirhams. We only accept cash purchases and recommend you contact our office in advance if you wish to place an order. Customers must collect the DVD themselves from our office. We do not provide any mailing service. As a result of recent activities and publicity there has been a marked increase in the number of visitors to the ADIAS website. 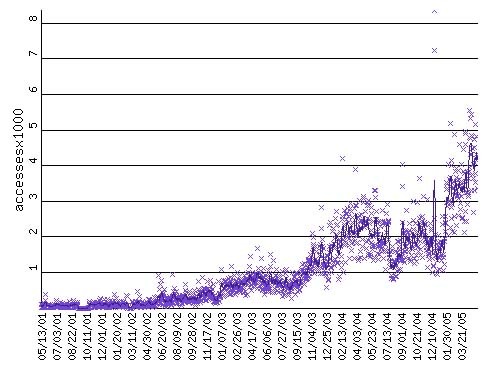 During April 2005 the site registered more than 110,600 hits from 19,284 unique visitors, an average of around 3687 hits per day from 643 unique visitors. The average monthly visitor trend continues to increase. 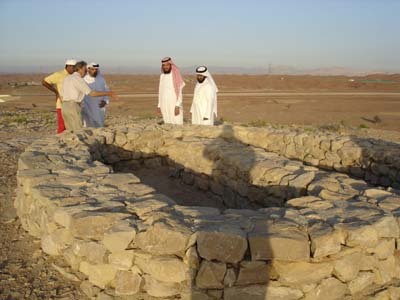 Dr Walid Yasin Al-Tikriti gives a guided tour to the GCC team visiting the Umm an-Nar tombs at Qarn Bint Saud. On the 21st March, Dr Mark Beech visited the GCC archaeology team being hosted by the Department of Antiquities and Tourism in Al Ain, seeing their excavations at the Iron Age II settlement at Rumeilah, and joining them on a field trip to the archaeological sites at Qarn Bint Saud, led by Khalfan Al Zahry, the Department Head, Mohammed Amir Al Neyadi and Dr Walid Yasin Al-Tikriti. Further work has been undertaken recently at the Umm az-Zamul Neolithic sites. Following the recent season of work (29th December 2004 - 23rd January 2005) at Umm az-Zamul, carried out by ADIAS in collaboration with the Department of Antiquities and Tourism, Al Ain, further work was carried out from 9th 12th April by a team consisting of Dr Anja Zander (Faculty of Geography, Philipps-Universität Marburg, Germany), Dr Heiko Kallweit (ADIAS Associate) and Dr Mark Beech (ADIAS Senior Resident Archaeologist). This involved geological and geomorphological reconnaissance of the entire area. 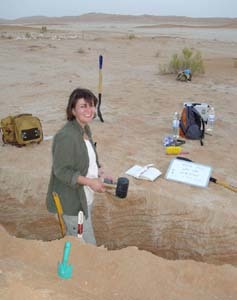 A number of soil pits were excavated to record relevant stratigraphic profiles. Sediment samples were taken for characterisation and evaluation. Dr Anja Zander, an expert in luminescence dating also took a number of OSL (Optically Stimulated Luminescence) samples. These will be taken back to her laboratory at Marburg University in Germany. The samples were taken from sand dunes located above and below our Neolithic flint scatters in the hope that this might provide a bracketed age for the formation of the sediments surrounding the archaeological sites. For those of you who are curious what OSL dating is, and how it works, here is a simple explanation. Optically Stimulated Luminescence (OSL) dating is a relatively new alternative approach to chronological problems. Both quartz and feldspar rich sediments, which are undateable by conventional radiocarbon methods, can be absolutely dated (± ~10%) within a range of 100 to 200,000 years. Sediments everywhere contain low concentrations of uranium, thorium and potassium which produce, over geological time periods, a constant flux of ionising radiation. The ionising radiation is absorbed and stored by surrounding sediments and with stimulation this stored dose can be evicted producing luminescence. The amount of luminescence emitted is proportional to accumulated dose and with the annual dose an age can be determined. The calculated age is the time elapsed since the sample was buried as sunlight bleaches away the luminescence signal so resetting the 'time clock'. Aeolian sediments are ideal as exposure to light prior to burial is guaranteed but samples from other sedimentary environments have also been successfully dated. So, now you know! 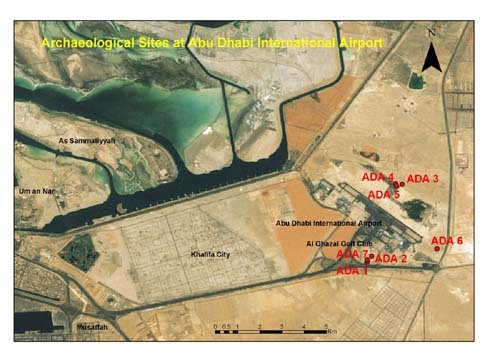 In association with the Supervision Committee for the new Abu Dhabi International Airport, SCADIA, and engineering firm Parsons International, an ADIAS team comprised of Dr. Geoffrey King, Academic Director, Peter Hellyer, Executive Director, and Chen Qing, School of Oriental and African Studies, University of London, carried out a field survey in early April of the area allocated for the construction of the new Airport terminal and runway. Several new archaeological sites were discovered during the survey, including a group of three stone cairns that may possibly be pre-Islamic burials. In all, 10 sites of archaeological and palaeontological interest have now been discovered in this area, including several identified during earlier work by Peter Hellyer and Simon Aspinall, ADIAS Environmental Studies specialist, in 2000 and 2004. SCADIA is carrying out a full environmental and archaeological assessment of the area, in accordance with Environmental Impact Assessment legislation overseen by the Environmental Research and Wildlife Development Agency, ERWDA. A rescue excavation of the group of three cairns is now planned for June, and, if they prove to be pre-Islamic burials, they will be rescued for future display in the new Airport terminal. Dr Mark Beech (ADIAS Senior Resident Archaeologist) has been invited to visit Kuwait from the 31st May to the 3rd June 2005, by Shihab Shihab, director of the Department of Museums and Antiquities, part of the National Council for Culture, Arts & Letters in Kuwait. Dr Beech will be accompanying Dr Benno Boer, Programme Specialist - Marine, Coastal and Terrestrial Environmental Science from the UNESCO Regional Office for the Arab States of the Gulf, Doha, Qatar, as well as other environmental experts from the region. The purpose of the visit is a fact-finding mission to Failaka Island to examine the archaeological sites and their natural settings and to assess and monitor the threats to them posed by modern developments on the island. ADIAS has been invited to participate in the forthcoming Symposium on Integrated Coastal Zone Management, organised by the Environmental Research and Wildlife Development Agency (ERWDA) in Abu Dhabi. The Symposium will be held at the Beach Rotana Hotel in Abu Dhabi from the 5th to 8th June 2005. Dr Mark Beech and Peter Hellyer will make a presentation entitled "The Coastal Archaeology of Abu Dhabi Emirate - The value of an ICZM approach towards management of the heritage of the UAE". This will outline the more than thirteen years of work carried out by the Abu Dhabi Islands Archaeological Survey (ADIAS) in the region and will describe the methodology utilised in the identification and recording of archaeological and palaeontological sites in the coastal area of Abu Dhabi. 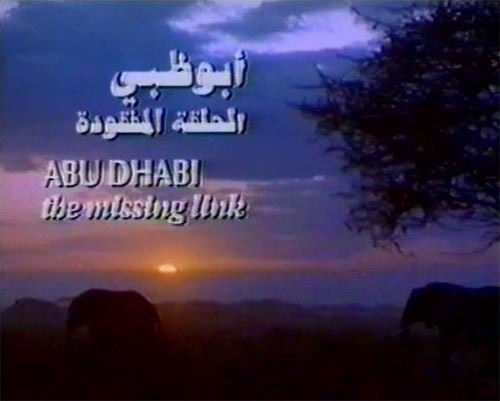 A brief overview will be provided of the ADIAS Sites Database, a geo-referenced database of archaeological sites for the Western Region of Abu Dhabi. This forms an integrated component of the Abu Dhabi Environmental Database, a GIS-based system managed by the Environmental Research and Wildlife Development Agency (ERWDA). On the 5th April 2005, Dr Heiko Kallweit, ADIAS Associate, gave a lecture to the Abu Dhabi branch of the Emirates Natural History Group in Abu Dhabi, entitled "Fred Flintstone's Toolbox - Recent Archaeological Studies at Umm az-Zamul". He talked about the recent work carried out by the ADIAS team in the south-eastern deserts of Abu Dhabi. Click here for more details about this work. On the 6th April 2005, a joint paper written by Dr Heiko Kallweit, Dr Mark Beech, Richard Cuttler and Dr Walid Yasin Al-Tikriti was presented by Dr Heiko Kallweit at the 3rd Annual Symposium on Recent Archaeological Discoveries in the United Arab Emirates, organised by the Zayed Centre for Heritage and History, and held in Al Ain. This again discussed the results of the spring 2005 season at Umm az-Zamul. On 10th May, Peter Hellyer spoke to the Zayed Private Academy in Abu Dhabi on an overview of the history of Abu Dhabi, and also presented a slide show to the students on the forthcoming Late Miocene fossils exhibition. Dr. Mark Beech's PhD thesis, published last year as Abu Dhabi Islands Archaeological Survey Monograph 1 - In the Land of the Ichthyophagi: Modelling fish exploitation in the Arabian Gulf and Gulf of Oman from the 5th millennium BC to the Late Islamic period. (British Archaeological Reports International Series S1217. 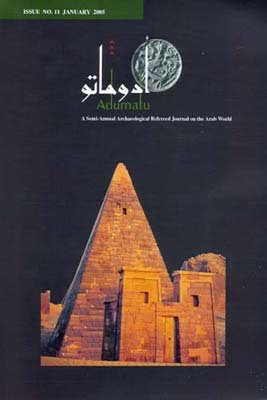 ArchaeoPress, Oxford), was reviewed in the January 2005 edition of the journal Adumatu (Issue no.11). click here to read the arabic version (pdf file - 502 Kb). click here to read the english version (pdf file - 231 Kb). Beech's thesis has more than doubled the total number of studied fish bone assemblages in the whole of the Gulf". 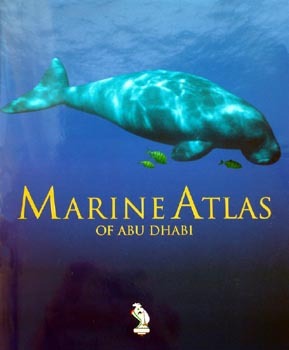 Marine Atlas of Abu Dhabi. Milan, Italy: Centro Poligrafico Milano SpA. Aspinall S., R.Loughland, A.H. Al Ali and S.A. Wrdyani. 2004. Important Marine Areas for Birds in Abu Dhabi Emirate. Pages 218-237. Beech, M.J. 2004. The Fish Fauna of Abu Dhabi Emirate. Pages 158-183. Hellyer, P. 2004. The Archaeology of Abu Dhabi's Coastal Zone. Pages 40-55. Beech, M., R. Cuttler, D. Moscrop, H. Kallweit and J. Martin. 2005. New evidence for the Neolithic settlement of Marawah island (Abu Dhabi, United Arab Emirates. PSAS 35. Kallweit, H., M. Beech and W.Y. Al-Tikriti. 2005. Kharimat Khor al-Manahil: New Neolithic sites in the south-eastern desert of the United Arab Emirates. PSAS 35. Beech, M. In Search of the Ichthyophagoi: Neolithic Fishing Communities of the Arabian Gulf and Gulf of Oman. This was a paper presented by Dr Mark Beech at the International Conference, "Magan, an Early Arabian Civilization and the first Maritime Trade between India and the Near East", held from 24-25 April 2004 in Muscat. The paper has been submitted to "Magan", the new journal to be produced by the Department of Excavations and Archaeological Studies, Ministry of Heritage and Culture, Muscat, Sultanate of Oman. Some of the ongoing work on the environmental remains from the 7000 year old settlement on Dalma island is also to be published. A revised version of the paper originally presented at the "Fifth millennium BC in the Near East" conference, held in Liverpool, U.K. (15-18 November 2001), has been submitted to the journal "Paléorient". Beech, M. and E. Glover. The environment and economy of an Ubaid-related settlement on Dalma island, United Arab Emirates.